What’s better when weather is hot, or a quick celebration after a winning game, than ice cream? A cone, a sundae, a milkshake, it doesn’t matter. It’s nearly impossible to be unhappy while eating ice cream, unless, of course, it’s to soothe a sore throat or bribe an unhappy child. Even then, ice cream seems to bring a dose of cheer along with it. 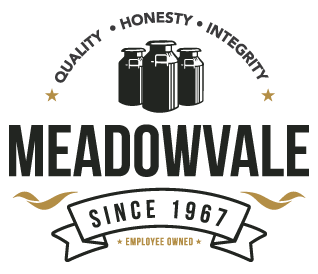 Meadowvale, Inc., as a purveyor of ice cream products, might as well be said to be selling smiles and laughter too. The Yorkville-based company sells a variety of mix products, from soft-serve and frozen custard to premium hard ice cream and private label mixes. That doesn’t mean you can waltz into their plant and enjoy an ice cream cone, however. Their product, while it certainly ends it cycle as a cone or other treat, is delivered to their customers in liquid form and has only to be mixed with air to become what we think of as ice cream. A growing company Steve Steinwart is president of Meadowvale, Inc., but that wasn’t always the case. It’s a position which he not only earned, bust also inherited from his uncle, John Steinwart. As time went on, John decided to put a management team in place that would allow him to retire without selling the company, but continuing to watch it grow. Unfortunately, he never got to really watch the growth. The team he had hand-selected was in place when he started having health problems and he died in 1992. Steinwart’s experience working as a district manager for Dairy Queen in Missouri, then returning home to help run one of his father’s Dairy Queen stores, helped prepare him for his current role. Saying he never intended to remain working for Dairy Queen, he said the opportunity to work for Meadowvale came along and he thought it would be fun to work with his uncle. While Meadowvale can offer guidelines for making different flavors and the ratio of air to mix, Steinwart said most of the customers are very independent and develop their own recipes and preferences. He also noted that the difference between ice cream and frozen custard is the amount of egg yolk. Frozen custard has a much higher amount, and must meet a certain percentage to legally be called frozen custard, about 1.5 percent. It also, generally, has less air in it than ice cream or soft serve, giving it a creamier, richer texture. Those customers who purchase their base to make hard pack ice cream, Steinwart said, are very particular about the products they use because their name goes on the ice cream. They may freeze it in three gallon tubs for scooping or package it for resale. The company also sells nuts, candies, toppings, and other ice cream related items as a convenience for their customers. “Jason Leslie added that resale program about six or seven years ago and it’s really taken off for us, allowing us to bring more items into a stare,” he said. The ice cream manufacturing business, he commented, isn’t just about cold, creamy treats anymore. Government regulations require them to be able to trace not only where their ingredients have come from, but also which batches of product they have gone into and where those products have been sent. That way, if there is a problem with an ingredient, it can be fully traced and recalled if necessary. “We haven’t had that situation here,” Steinwart said, “But we have to prepare for it. So we do mock recalls during the year.” Those, he said, are done two ways, one for a potentially bad mix and the other for bad ingredients. While the process of tracking and preparedness is involved, it becomes less demanding once it is part of the process. Most of their ingredients are liquid-the milk, cream, vanilla, and even the sugars. That all gets pumped into a tank. The dry ingredients, such as nonfat dry milk, stabilizer, and cocoa powder are weighed and, as general manager Hilary Rose explained, enter the tank by use of a funnel, a vacuum and blades which make sure there are no lumps. On a tour of the facility, Rose showed the computer which aids in production, tracking batches from one tank, through the pasteurizer, the homogenizer, and into the holding tank. From the holding tank, mix is packaged in either two-and-a-half or five gallon bags which are then packaged in either boxes or plastic cases, stored in a large walk-in cooler, where they wait until loaded onto a truck. The facility was expanded with a new cooler and offices about two years ago and, as one would expect, is neat and orderly with dry ingredients stacked on pallets, finished product stacked neatly in boxes or crates, equipment being thoroughly cleaned, and hair nets required to be worn over hair and ears when in production area. Currently, Rose is in an orange hair net phase, joking that last month she was in a green phase. Manufacturing is a continuous process, Rose noted, adding that if they have to stop mid-process, they lose roughly 100 gallons of product. The three mixing tanks vary in size from 600 to 1,000 gallons and are connected to the pasteurizer, which heats the product in a series of pipes taking 32 seconds from beginning to end. The unit has been sealed in a number of ways by state inspectors, certifying that the system is complying with requirements and guaranteeing no unpasteurized product will enter the homogenizer. The pasteurizer heats the mix to a certain temperature to kill any bacteria while the homogenizer breaks down any butterfat and prevents it from separating. “Without the homogenizing, it would look like there are yellow chunks of butter, because that’s what it is. It just breaks down the fat,” Steinwart said. Once the product goes through the homogenizer, affectionately nicknamed Mabel, it will be sent to the holding tank designated by the computer. When the mix is being packaged, Rose noted that they can fill one bag every two seconds or 18 bags per minute. The production takes place during the night hours, during 10 hour shifts, due to the reduced cost for electricity during off-peak times and cooler temperatures. The company produces enough mix during each week to supply their customers with only a little cushion built in. They do this using customer orders and historical data to predict how much they will need as the mix does have a limited shelf life. Rose said the overall timeline includes the cows being milked in the morning, the milk delivered in the afternoon, the ice cream mix produced overnight and shipped out to customers the next morning. Their peak season, Steinwart said, is from April through September. While there are orders throughout the rest of the year, they find other projects to keep staff busy. Rather than lay off employees, he noted it is more cost effective to keep continuity with trained employees. As he looks to the future, he said the next year will find them changing over to a local-area firm to provide trucking and delivery of their product rather than having their own drivers. It’s a substantial change, he said, that they are in the process of notifying affected customers about. Eliminating the trucking, Steinwart commented, will allow them to focus on their strength, making ice cream mixes that generate those laughs, smiles and sticky faces.